For the ultimate LaserZone experience! 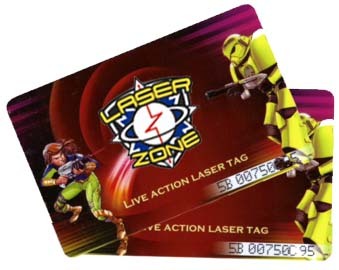 A Membership at LaserZone is the way forward for any regular player. Membership gives discounted prices for games (see the Prices page for details). Membership allows players to choose a unique identifying "Alias", which is used to identify the member and is printed on Scorecards and rankings. Membership provides invitations to ‘closed door’ special events for members only. Our memberships last forever - you get a lifetime of discounts for a 1 off fee. Your membership is valid at both Bradford & Huddersfield sites. Once you have your membership, you will receive a "Member's Button". This logs your "Unique Alias", used to identify you with our systems. Before the game starts, members hold their Button to the front of the pack until our computer acknowledges them. After the game, the scoreboard will use their Alias to identify the member from other players. Our computer also records score and accuracy to calculate scoreboards, accuracy charts and rankings.